Silent Night, Bloody Night is an eerie and disturbing little proto-slasher. Filmed in 1972 and arriving in 1974, it predates even Black Christmas, yet features several elements that have become familiar today: the holiday setting, the menacing phone calls, the nebulous identity of the killer, the "final girl". At the same time, its Gothic-style focus on the tragic history of a big, creepy house places it at the intersection of classic and modern approaches to the horror genre. At worst, it's a curiosity; at best, it's a forgotten minor classic. The Butler house has stood for decades. Its owner, the eccentric Wilfred Butler, was an absentee landlord. 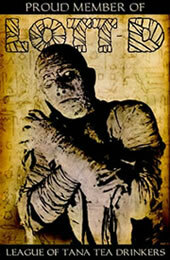 He returned in 1950, but only a short while later, accidentally set himself on fire and died of the burns. He left the house to his grandson, Jeffrey, who has never appeared to claim it. No one has lived there since Wilfred's death. As the film opens, Jeffrey Butler has finally offered to sell the house. News of this spreads across the small town, reaching even an insane asylum. There a maniac breaks loose to seek a long-deferred revenge. Early on, the movie focuses on Jeffrey's lawyer, Carter, and Carter's young mistress; later the focus shifts to Butler himself and the Mayor's daughter Diane. Bodies drop, sometimes unexpectedly, as the two of them learn the Butler house's dark secrets. The first thing one notices about Silent Night, Bloody Night is its bleak atmosphere. Shot on-location in New York State, the film captures the oppressive gloom of the northeastern American winter, and the small-town setting seems not so much homey as desolate. Many scenes are filmed in small, cramped rooms, in or around cars which form tiny islands of light in the midst of the vast rural-winter darkness, or in the cold, cheerless chambers of the empty Butler house. The cinematography grows darker as the film progresses. This adds to the mood but does have an obvious drawback (aggravated by the poor visual quality of the DVD transfer): sometimes it is almost impossible to tell what's going on. In one scene taking place on a country road at night, the frame goes almost totally black, and the viewer is forced to piece together what has just occurred from dialogue and sound effects. Even a small addition of artificial lighting would have benefited the scene. The movie's other weaknesses are the stiltedness of its leads and the inanity of some of the script. Upon meeting Jeffrey, Diane invites him into her house just so she can point a handgun at him and say "That's far enough!" Then, moments later, they seem to have become friends, and with astounding speed agree to work together to solve the burgeoning mystery. Their relationship feels forced by the script's requirements. John Carradine appears in a small role as the local newspaperman, but he hasn't much to do - or say, as his character is mute for some reason. Fortunately these aren't huge drawbacks. The emphasis here is on atmosphere and story, both of which are handled well. Early in the film we can see that the aged members of the town council are afraid of something. Their fear grows all the more obvious when the escaped maniac begins making phone calls to each of them, claiming in a raspy whisper to be someone named "Marianne." The old folks here know what happened at the Butler house. And they guard that knowledge jealously. Archived newspapers have stories cut out of them, and the council members want to buy the Butler house from Jeffrey so they can destroy it and bury its secrets forever. The naïve Diane, a lifelong resident and the Mayor's daughter, is oblivious to her hometown's legacy of murder, madness, and sexual perversity. Carter and Jeffrey, on the other hand, come from the big city, where time has moved on. They're obvious outsiders in this silent little place. Carter, the high-powered lawyer, arrives in town with a young mistress who waits in the car while he phones his wife. Jeffrey Butler lives in California, having fled his family's home for someplace more cosmopolitan. These are people who have benefited from the post-1960s relaxation of social mores. Carter and his mistress in particular are dismissive of the town, leaving them unprepared for what awaits. During the climax Jeffrey discovers and reads his grandfather's diary. This leads to a slightly cheesy but creepy flashback sequence which reveals the killer's identity and motivation. The flashback (which is around ten minutes long) is filmed in black and white, with some sort of dusty brown filter, giving the scene an "unclean" look, and rendering all the more striking its images of vengeful asylum inmates on the killing march. The subsequent payoff is both satisfying and disturbing. Rather than a "cymbal crash" followed by an "aha," we are left with loose ends that slowly tie themselves together into something that retains the power to unsettle even after the movie is over and safely back in its case. The ending is bittersweet. The one surviving character has made it through the night, but seen too much and lost too much. Survival is won by force and luck, as would go on to be the case in subsequent slashers. The film's final image, though, is of a bulldozer advancing towards the Butler house, recalling the theme of escape from architectural (and psychological) oppression that ran throughout Gothic literature and informed much pre-1960's horror. Destroying the house may be a moral victory, but the trauma of what happened there lingers on. We are left with the impression that the evils of the past will never really relent in forcing their way into the present, particularly in a small, isolated town like this one, where so little changes over the years and the past is never far behind. 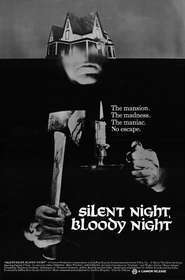 Silent Night, Bloody Night has some flaws, and most of its elements are now familiar enough to have lost some of their impact. Nevertheless it's a worthwhile film, with its engaging story and ambience of sadness and dread. One can see it nodding back to the likes of Psycho and The Old Dark House even as it looks forward to the slasher films of the late 1970s and early 80s, making it something of a turning point in the genre. Submitted by kevin (not verified) on Mon, 2010-11-08 19:57. Excellent review of an underrated horror film that most viewers have dismissed due to the poor quality prints available. I own the REEL CLASSICS DVD, which appears to be the original theatrical print. If you cannot read the opening credits, it's a bad print. Tony Award-winning actor James Patterson, who plays Jeffrey Butler, died of cancer in the summer of 1972, making this his final film, and he didn't make many. Mary Woronov was then married to the film's director, Theodore Gershuny, and did a second feature for him, 1973's "Sugar Cookies" (he died in 2007). Patrick O'Neal was always underused, but here gets top billing in a role that he seemed born to play, the slick big city lawyer who receives a shock at the end of his destination. As the fearful town council, Walter Abel and John Carradine, both veterans of old Hollywood, are joined by local New Yorkers Walter Klavun and Fran Stevens, along with some of Andy Warhol's stock of performers (Candy Darling died in 1974). Little is known of lovely Astrid Heeren, who never did another feature. Gershuny scripted with Ami Artzi and Jeffrey Konvitz, who went on to write 1976's "The Sentinel," which coincidentally also wasted John Carradine (allowed to at least speak one line of dialogue). Submitted by Anonymous (not verified) on Wed, 2011-12-28 17:25. It seems like a decent movie (if you can overlook the campy 70's fashions and hairstyles), but I think I need to watch it again to fully understand this story. Everything seems so confusing. I get the impression that the older citizens of the town were all escaped mental patients, including the Mayor, telephone operator and the Sherriff. I've seem the movie twice already, and still have a difficult time putting all the pieces together.